Ken Metzner is executive director of Kun-Yang Lin/Dancers, a lawyer and minister who advocates for his beleaguered community and the entire City of Philadelphia for reform of the Board of Real Estate Taxes (BRT.) It’s a Sisysphian battle but we’ve won a few rounds thanks to active citizens like Metzner. Now this unqualified board is calling homeowners to inspect the interior of their homes, an unprecedented move. Even the office of Licenses and Inspection can’t be moved to inspect a home’s interior unless they receive many complaints from neighbors of a valid problem. Please take a moment to read Metzner’s letter below and let him know what you know about interior inspections. c. know what it is exactly they are looking to find and d. how that would influence my tax assessment. Hi Folks — A few people who have appeals pending before the BRT for the proposed 2011 taxes have contacted me recently to say that the “Office of Property Assessment” [new name, same assessors] has been calling to schedule an inspection of the INTERIOR of their homes. I’d also like to hear from any long-time Philly residents regarding their experience, if any, with interior inspections being requested by an assessor. Our feeling is that this is something very new. Thanks for keeping the information flowing. French Dance Company – “Cie Herve-Gil” to perform in Philadelphia at The Drake Theatre. “Fleurs De Cimetiere et autres sornettes”. Performed by Parisian women 50-65 years old. Drake Theatre -1512 Spruce St.-Philadelphia, Pa. 19106. “Fleurs de Cimetière” performed at the Avignon Festival, July 2009, and have since toured in France with performances scheduled to May 2011, as well as the Edinburgh Festival August 2011. A tour in Taïwan is scheduled for spring 2012. Cie Herve-Gil has performed numerous times in the US. Between 1989 and 1993 at the American Dance Festival, Jacob’s Pillow, Pittsburgh and Philadelphia. This year the company is celebrating their love of Philadelphia! – the anniversary of Cie Herve-Gil: 25 years old! – the anniversary of Choreographer Myriam Herve-Gil – working in Philadelphia for 20 years! -20 years ago, Susan Glazer & Uarts invited the company (at this time the name was “La P’tite Cie”) to perform at The Drake Theater. -Myriam was invited numerous times as a guest choreographer and teacher at Uarts, and created numerous pieces for the students. -Last time Cie Herve-Gil performed was in Philadelphia in January 2007, invited by Melanie Stewart to present a duo in her New FEstival. Contact: Susan Gish for more information: casting@philacast.com – 215-592-7575. There is no phone number for reservations as the company is in France. Walk-ins before each performance are encouraged. Reviewers may contact Susan Gish at the above email for comp arrangements. What do five 60-plus black women share that has brought them together in a single show?Answer: All five have been making dance against heavy headwinds for as long as half a century. Each has received honors and accolades, and is still flying high. Yet none is as well known outside dance circles as, say, Judith Jamison or Debbie Allen. So Georgiana Pickett, executive director of Brooklyn’s 651 Arts, in 2009 conceived a show that would give audiences a glimpse of the rich span of dance contributed by these dancer/choreographers for three generations and 50 years. This weekend that show, “Fly: Five First Ladies of Dance,” comes to the Painted Bride Art Center. Martial Arts: A Training Discipline for Dance? The martial arts and martial arts training are practiced internationally and in recent decades they have played a role in reshaping dance and choreography in the United States and Europe. By studying and training in any of the martial arts, a dancer’s body absorbs movement and takes on a different look in motion. For example, when modern dancers, and even some ballet dancers, see the elongated limbs and fluidity of Asian-trained dancers’ bodies they often take advantage of some kind of Asian martial arts cross-training. They may take Tai Chi for its slow-movement that stretches and strengthens the joints safely. The Afro-Brazilian discipline of capoeira, called the “Dance of War,” is also popular. It evolved when slaves disguised their movement as dance for the entertainment of the slave-masters – who would otherwise have banned it. Taking capoeira classes greatly enhances athleticism, timing, bounce and rebound for contact-improv, release-technique, hip hop and dancers of many other forms. Anyone who has seen Kun-Yang dance is aware that he embodies discipline and movement resulting from martial arts training. In the second layer of his five-month training intensive, Lin invited Sifu (means master, tutor or teacher) Chik Qadir Mason to introduce martial arts disciplines to his company, Kun-Yang Lin/Dancers, and others who enrolled in a class for the training. Mason began on September 12 with Chi Kung, the original art as it was practiced in old China, and by the project’s end Mason plans to have them practicing the more modern Tai Chi. 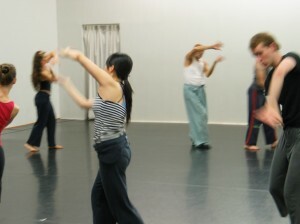 As the first master teacher in the project, Hsu-Hui Huang from Taiwan’s famed Cloud Gate Dance Theater said, “We want to help them externalize their internal energy.” Among other practices, breathing exercises help the dancers go deeper into concentration which allows them to bring more organic nuances to their dancing. Breath did not enter into Mason’s first two sessions, but I it will as he progresses. I’m involved in the project as its chronicler. But instead of merely observing and reporting, I decided to internalize the external and took part in the first two sessions. For someone who isn’t sufficiently physically active, the first slow and gentle session was just enough to get me feeling stretched and energized. I liked it. The second week was a little more rigorous and I (mostly) completed that one as well. I know how dance feels. But I didn’t know how performing a martial art would feel. Now I get that it trains a different kind of muscle memory than dance. For one thing, the feet are more firmly planted on the floor, not poised for jumping or relévè. But the knees are almost always in slight plié which would give you the spring for jumping. The 61-year-old Mason is spryer than men half his age and moves rapidly between exercises. In one exercise, Swimming Dragon, he says “The body wants to move like a dragon and the arms like a snake.” The dancers pair up, with one taking an active role and the other inactive, or reactive. Mason says his teachers in Hong Kong, where he studied from 1982 to 1987, had been bodyguards of Chiang Kai Shek, President of the Republic of China (Taiwan) until his death in 1975. He also studied with author and teacher Lao Shi Adam Hsu in California where he achieved Wu Tang Kung Fu Black Belt Status. Mason laid out a very clear program for his workshops which include teachings by Hsu in the last two October sessions, the 24th and 31st. In November he moves into fundamental stance-punch-kicking drills that end in fighting duets. On Sept. 18 Hua Hua Zhang, a master puppet artist, began her workshops for actors and dancers which last through the end of October. Mason’s sessions continue weekly through December 5.